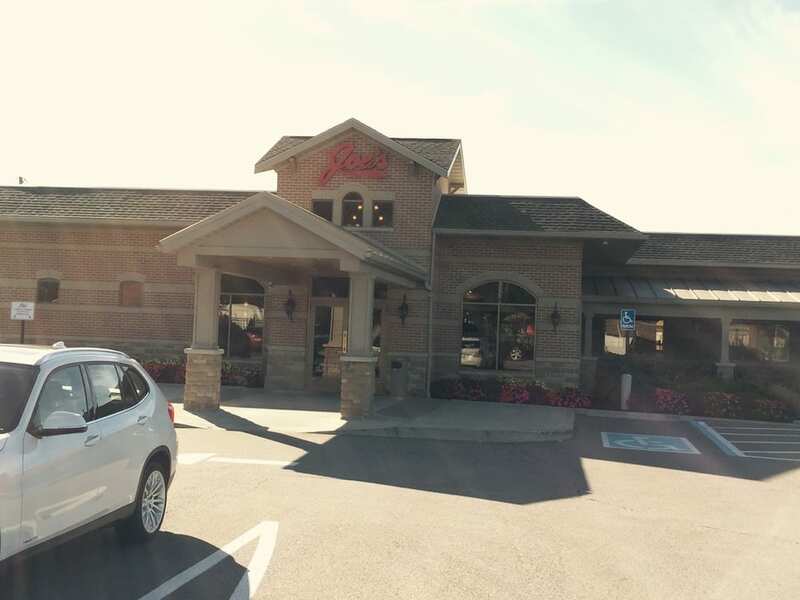 Joe’s Deli is a popular restaurant on the West Side of Cleveland. 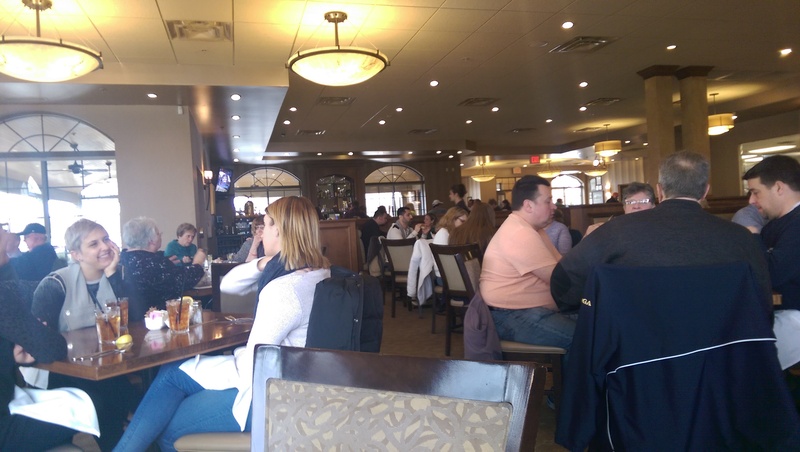 It is so popular that they built a larger restaurant, and it still has waits. If I lived closer I would be there all the time. As it is, I go when I visit my tax preparer. It seems like no matter when I go I have a wait (and I try to go at non-peak hours to avoid a long wait). 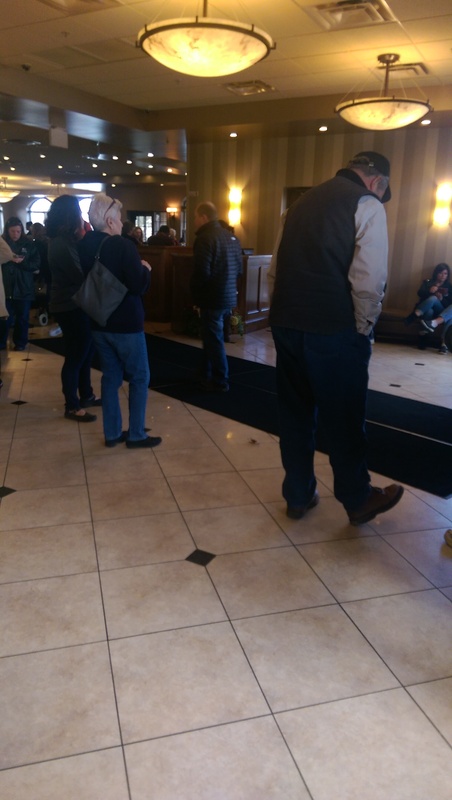 They have a large vestibule that is usually packed with people waiting for a table. You go in, get your name on the list with the hostess, and get a flashing beeper-type thing that tells you when your table is ready. In the meantime, you can either sit or stand along the walls or admire the gorgeous cakes in the counter cooler. I have yet to have room to order dessert. Maybe some day, because they look amazing. You can also glimpse inside their open kitchen, which is spotless, and you can see the kitchen staff working hard. The servers and staff are extremely efficient. The bussers are very polite when removing diners’ dirty plates. My waitresses have been friendly and quickly fill up my ice tea without my having to ask. They masterfully handle large tables and small. The first time I was there I was seated near a loud and obnoxious table of diners, but it has proven to be the exception to the rule. 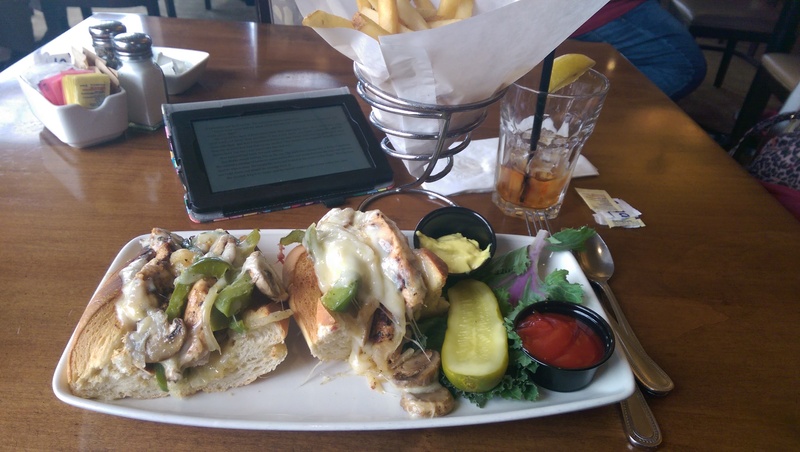 I take my Kindle and enjoy a nice meal in a nice setting. Joe’s is a Lebanese family-owned restaurant serving up amazing American and Lebanese fare. They are cousins to the Slyman family, so you know it’s going to be good. 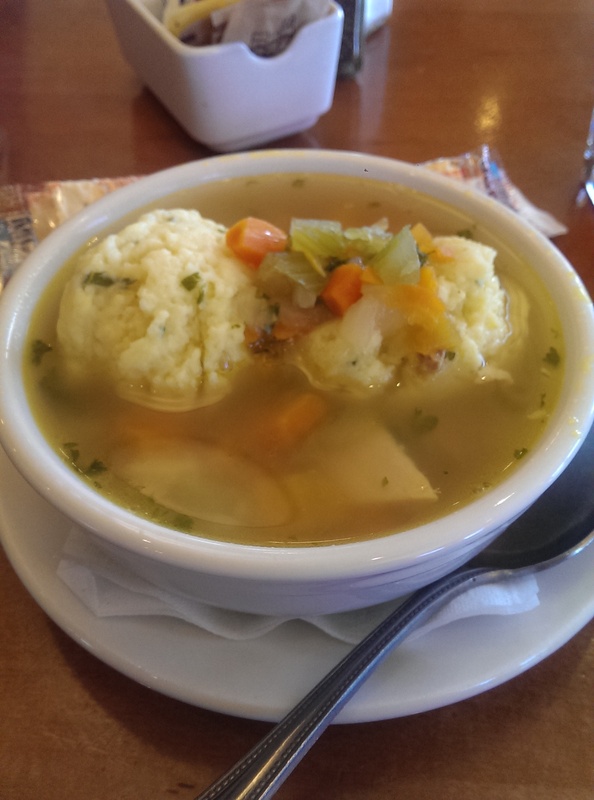 They also happen to serve the absolute best matzoh ball soup in Cleveland in my opinion. 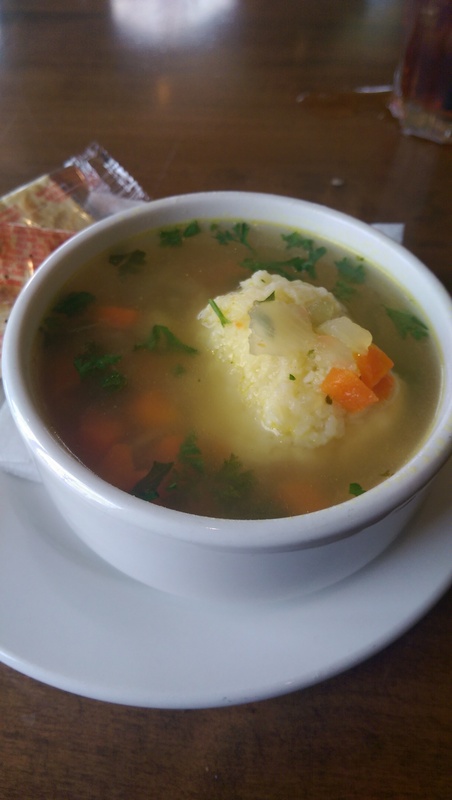 The broth is smooth, the matzoh balls are perfectly cooked, and the soup is chock-full of carrot, celery, onion, chicken and parsley (not typical but still tasty). I order it every single time I go, and then get a bowl to go for later that day. The portions are huge, and I have yet to eat a full sandwich there. I bring it home and eat it later with my bowl of soup. One of my friends from high school met me in the parking lot to drop something off the other day, and he reminisced about how much his mother used to love their German dumpling soup. I did a little research and discovered that is their soup of the day on Saturdays. According to Yelp the place is packed all day, but it might be worth it to go on a Saturday to try the soup. What I found were rave revie ws. The first time I went I got the Matchmaker – a bowl soup paired with a half portion of any of their house salads. 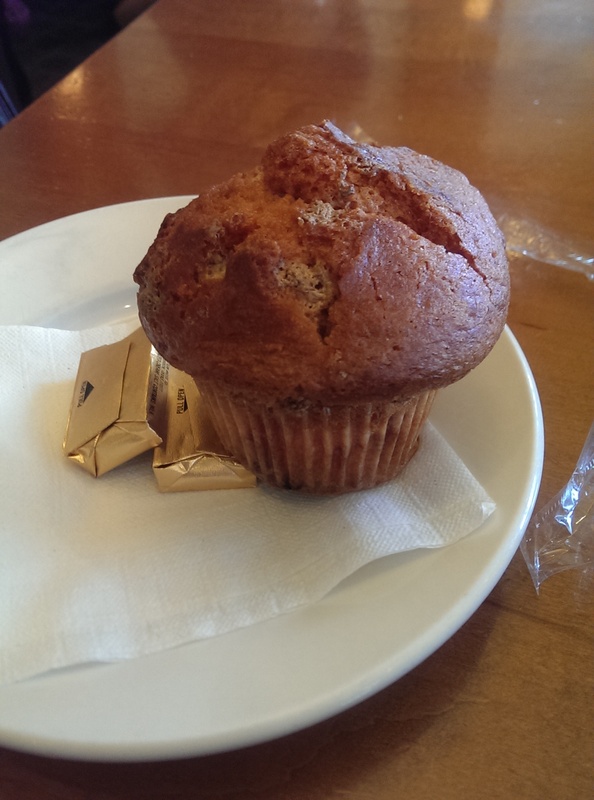 It also came with a muffin. 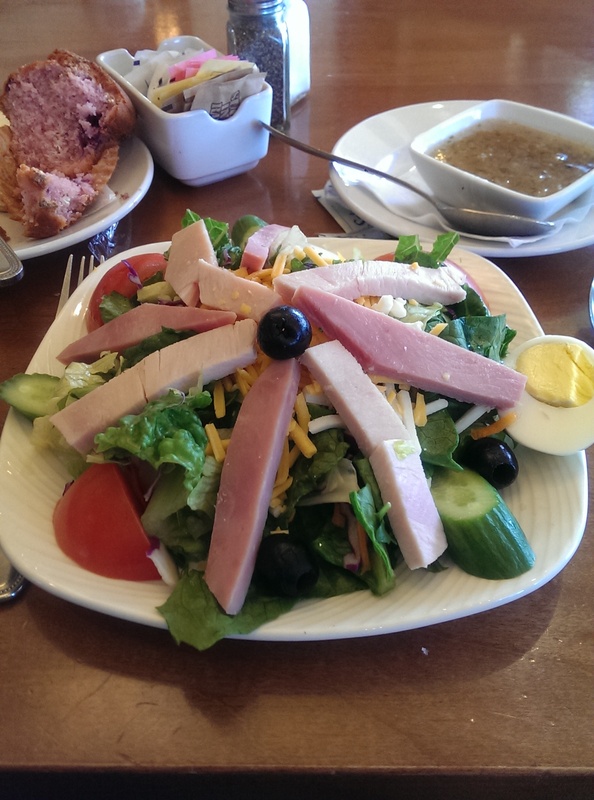 I ordered the Joe’s Chef Salad, which features fresh tossed greens topped with turkey, ham, Monterrey Jack and cheddar cheeses, tomatoes, hard-boiled eggs and black olives. The ingredients were extremely fresh and crisp. It was beautifully plated, and I ordered the hot bacon dressing and loved every bite. The muffin that day was a strawberry muffin. It was moist and delicious. I ended up taking half of the muffin home for later. It was a lot of food. On my second visit I ordered a simple tuna sandwich and a bowl of matzoh ball soup, thinking it would not be as much food. It was, but oh so good. 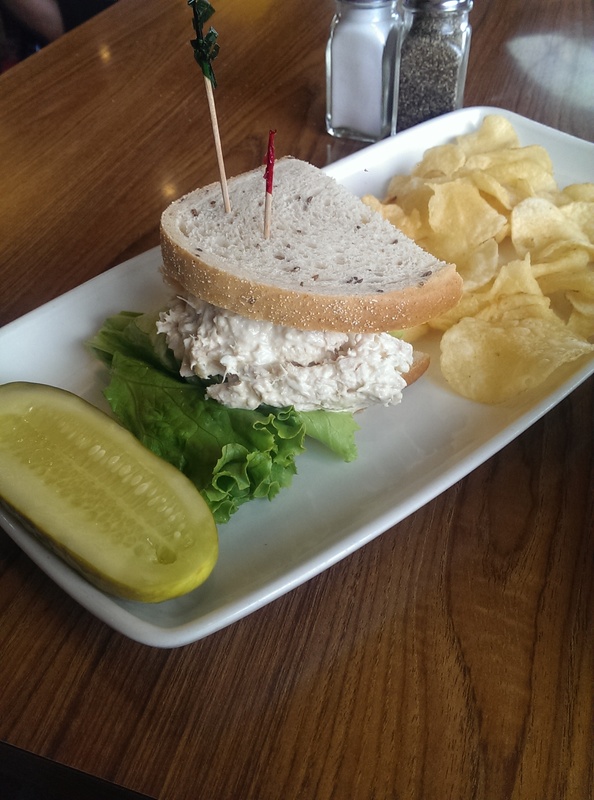 The tuna was fresh, the bread was perfect, and I loved the pickle. Their pickles are firm and have a really nice crunch to them. Of course I still ended up taking half of the sandwich home. On my third visit I ordered the Chicken Philly sandwich and a cup of matzo ball soup (trying to save room – it didn’t help). I wasn’t as in love with the Chicken Philly as I was with the other things. The bread was a little tough from the broiler, and the filling just seemed kind of bland. The peppers were definitely fresh, but they didn’t have much flavor. Maybe they were off-season. They have an aioli mayo that they serve on the side that jazzed it up a bit, but I don’t think I’d order it again. The French fries are good, but nothing to get truly excited about. 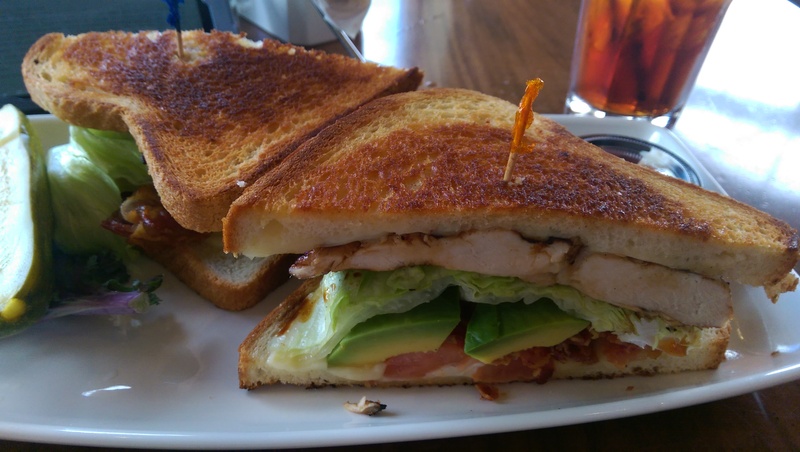 I had a cup of matzoh ball soup and the California Chicken Club on my most recent visit. It was wonderfully prepared with a thin grilled chicken breast, a hunk of fresh avocado, fresh lettuce (almost too much – it seemed like 1/4 of a head of lettuce and I had to remove some) and mayo. They served an herby sauce on the side, which I slathered on the sandwich as well. The juices dripped down my hand. It was an absolutely delicious mess. I nibbled on the fries and took half of the sandwich home for later (leaving most of the fries). As busy as they are in the restaurant, they also do a booming take-out business. They have two dedicated cash registers just for carry out. The phone is ringing constantly with new orders. This photo is of their Dawali (stuffed grape leaves). I wanted to try them, but knew I couldn’t eat a whole portion and a sandwich. so I got them to go. It was a good decision. 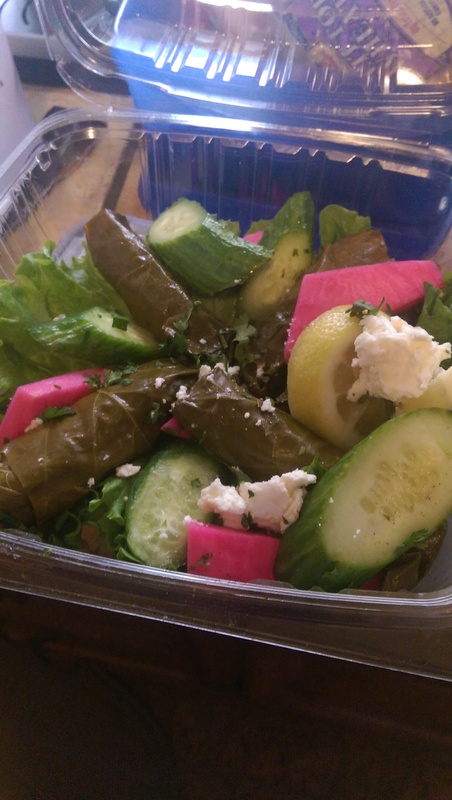 The pickled veggies, feta cheese and cucumbers accompanying the grape leaves were super fresh. They are open Monday through Wednesday from 7 to 9 PM and until 10 PM on Thursday, Friday and Saturday. They are closed on Sunday.